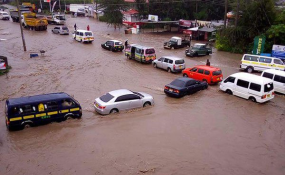 The rains flooded sections of the Eastern Bypass (file photo). The meteorological department has said the long rains will begin in April and not in March as is the norm. The weatherman explained that a tropical cyclone known as "Idai" that has hit Mozambique and Zimbabwe has played a key role in delaying the northward movement of the rain-bearing Inter-Tropical Convergence Zone (ITCZ). "The cyclone significantly reduced moisture influx into the country and this led to the continued sunny and dry weather conditions over the better part of the country," said the meteorological department in its latest update. The department warned of possibilities of more tropical cyclones in the South-West Indian Ocean Basin which may delay further the onset of long rains over the eastern sector of the country. "Despite the timely onset of the MAM 2019 seasonal rainfall over the western counties, prolonged dry spells are likely due to the existence of the TCs," it said . The rains in April are expected to be near-normal to above-normal rainfall over most parts of the country, more so in western Kenya, central Rift Valley, Northern Kenya (Marsabit, Moyale) and the central highlands including Nairobi. Depressed rainfall is however likely to occur over Northwestern Kenya. In May, most parts of the country are likely to experience depressed rainfall except the western, central Rift Valley and central Kenya regions which are likely to experience slightly enhanced rainfall. The weatherman also revealed that during the first two weeks of the March, high daytime and nighttime temperatures were recorded over most parts of the country. The highest daily maximum (daytime) temperature of 41.00C was recorded at Mandera station on 9th March, while Lodwar station recorded 40.50C on 3rd March 2019. This they said was because of the persistent high pressures over the Arabian region and the tropical cyclones in the western Indian Ocean.